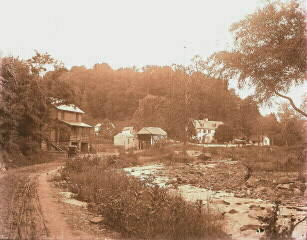 Country lane in the New Market area of Frederick County, MD circa 1890. 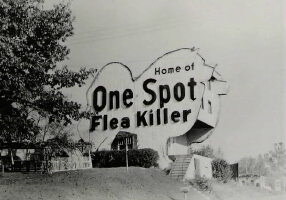 The following is a list of 21 of the photograph collections at the Maryland State Archives out of approximately 500 special collections containing photographs. These collections have been selected on the basis of accessibility, popularity, and quality. As time progresses, more collections will be added to this page, so it is advisable to check back here every once in a while. Computer indexes to these collections, except when noted, are in the search room of the Maryland State Archives. Please note: As a preservation measure, The Maryland State Archives does not allow film negatives, glass plate negatives, or glass lantern slides to circulate in our search room. Fragile prints may also be restricted from circulation. As a result, some collections do not have circulating images for every negative in the collection. This will be noted in the collection description, and we are in the process of printing 4"x5"copies of these images for the use of patrons in our search room. For a list of our hours, please see the reference services home page. If you are looking for photographs for publication, please take a look at our price list for photographs, publication and commercial use information, and our videotaping policy. Please keep in mind that individual photographs and entire collections may have publication restrictions on them. For further inquiries: Please contact Robert W. Schoeberlein, Curator of Photographs, Maryland State Archives, 350 Rowe Blvd., Annapolis, Maryland, 21401, or by e-mail at robs@mdarchives.state.md.us. For other interesting web sites relating to the history of photography, check out the list of Curator's Picks. Visit Maryland In Focus, a virtual exhibit of the Maryland State Archives presented as part of the Museum Online. Visit The Eye of the Beholder,.an exhibit of the work of photographer M. E. Warren, also presented as part of the Museum Online. This collection contains almost 2000 images, mainly of Annapolis, MD and the United States Naval Academy in Annapolis. These images, which are a combination of glass plate negatives, film negatives, glass lantern slides, and prints, were used by Mr. Forbes for lectures and other history related events in Annapolis in the early years of the twentieth century. The images, most of which were taken by professional photographers, date from circa 1870 to the 1920s, but most of them were taken between 1890 and 1910. Detailed lecture notes belonging to Mr. Forbes are also part of this collection, and contain information on individual photographs. Restrictions: Only approximately 1200 of the photographs have circulating prints. There are no restrictions on publication, and a computer index is available at the Archives. This collection consists of about 700 photographs taken by the Works Project Administration in the 1930s for a book entitled Maryland: A Guide to the Old Line State, published in 1940. 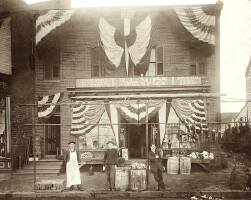 The photographs were taken in every county in Maryland, and cover not only historic sites and scenery, but also business and industry. Restrictions: There is no computer index; however, the collection has been organized by county, and in some cases by subject within the county. Restrictions: There are no restrictions on this collection. A computer index is available in the search room in the State Archives. The bulk of this collection consists of 300 glass plate negatives produced by Maryland amateur Maria Baldwin (1869-1962). Her work dates from approximately 1890 to 1910. Baldwin's images are set mostly in Baltimore and the Anne Arundel County areas of Millersville and Indian Landing. Subjects range from rural landscapes to family events and portraits of relatives. 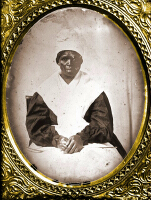 A few images of African-Americans are also featured within the collection. Restrictions: The glass plate negatives do not circulate. Fifty prints from a selection of negatives can be viewed at the State Archives. Contact the Curator of Photographs for more information about this collection. This collection consists of photographs taken between c. 1920 and c.1932 by Edgar H. Pickering, a well-known photographer in Annapolis, MD. They are architectural views of historic houses in Annapolis, MD as well as Anne Arundel, Baltimore, Charles, Dorchester, Harford, Howard, and Prince George's Counties, Maryland. Some of the historic homes this collection includes are the Hammond-Harwood House, the William Paca House, Habre De Venture, Belair, Cedar Park, Homewood, and Whitehall. Some photographs have copies in MSA SC 1804, the Hayman Jr, Donor Collection and in MSA SC 1754, the E. H. Pickering Collection and there are also some negatives in MSA SC 1936, the Pickering Negative Collection. A short biography of E. H. Pickering. The Merrick Collection was put together by Marion and Mame Warren for their book and subsequent exhibit Maryland Time Exposures 1840-1940.The collection consists of approximately 1800 copy photographs made by Mr. Warren from original photographs dating between 1840 and 1940. 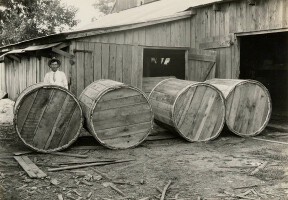 The photographs illustrate a cross section of life and culture throughout the State of Maryland during those years, including industry, watermen, transportation, education, resorts, family life, sports, and agriculture. All the counties in Maryland are represented, to a greater or lesser degree. Restrictions: There are restrictions on individual photographs in the collection, which are noted in the computer index. Copy images are available for patrons' use in the Archives Search Room. The Meade Collection consists of 90 prints and some 530 negatives taken by Rowland H. Meade, a commercial photographer in Annapolis, MD, between c. 1930 and c. 1950. The photographs are mainly Annapolis subjects, such as the City Dock, St. John's College, the U. S. Naval Academy, the Historic Homes, and other important sites in and around Annapolis. Restrictions: No commercial use is allowed for this collection, except for historic publications. A computer index for the prints is available,and an index is in progress for the negatives. This collection contains photographs of Annapolis and Historic Homes in Maryland taken between c. 1920 and c. 1932 by Edgar H. Pickering. There are also photographs of Colonial Day, an Annapolis celebration in 1928. Duplicates of some of these photographs and other photographs taken by Pickering can be found in MSA SC 1406, the Hayman Collection and MSA SC 1804, the Hayman, Jr. Donor Collection, and there are some negatives for these prints in MSA SC 1936, the Pickering Negative Collection. Restrictions: There are no restrictions on this collection. A computer index is available in the search room at the Archives. Photographs and negatives by E. H. Pickering and Howard E. Hayman,Sr of street and architectural scenes in Annapolis, MD, as well as historic homes in Harford and Baltimore Counties. Prints and negatives numbered below 500 are by E. H. Pickering and were taken between c. 1920 and c.1932. There are no prints for negatives numbered above 500, which were taken by Howard E. Hayman, Sr. between 1930 and 1960. Restrictions: There are no prints for negatives numbered above 500, and negatives cannot be circulated. Patrons must order a print to see the image. A computer index is available in the Archives' search room. This collection consists of approximately 60 photographs of street scenes and historic homes in Annapolis, Maryland, along with the U. S. Naval Academy taken by Henry Schaefer between 1888 and 1895. Restrictions: There are no restrictions on the prints in this collection. The leather-bound album in the collection does not circulate without the permission of the Curator of Photographs. A computer index is available in the search room in the Archives. A short biography of Henry Schaefer. This collection contains photographs donated to the Archives individually or in small groups. The images are very miscellaneous and include scenes in Annapolis, Baltimore and Anne Arundel, Carroll, Frederick, and Garrett Counties. Restrictions: There are no restrictions on this collection. A computer index is available at the Archives. This collection, which forms the bulk of the photographs held by the Maryland State Archives, dates from 1939 to the present, and is entirely the work of Marion E. Warren, a photographer in Annapolis, MD. There are some views of the midwest in the late thirties and Washington, DC and Europe during World War II, but the majority of photographs are of Maryland since 1947. The photographs are almost entirely black and white, with a few color slides, color negatives, and color tranparencies. The Maryland photographs cover the entire state, and the subjects include sailing, skipjacks, watermen, fishing, crabbing, and oystering on the Chesapeake Bay and its tributaries; tobacco farming and other agriculture, urban renewal in Baltimore City, street scenes, state and national parks, historic homes in Annapolis and throughout the state, aerials, and businesses and industry, including the work of Maryland architectural firms. The people of Maryland, at work and at play, are a major subject of the photographs in this collection, not only through the portraits and weddings Mr. Warren has photographed, but also through the candid shots he has done over his 60 year career. The collection also contains many copy photographs made by Mr. Warren both during his years as a professional photographer and during the work he did on the books he and his daughter Mame published. Since Mr. Warren is still actively photographing Maryland and the Chesapeake Bay, the collection will continue to grow over the years. An exhibition of his work was assembled in 1989, and the world wide web version of The Eye of the Beholder is now available at the Maryland State Archives. Restrictions: All photographs with numbers under 30,000 are restricted. Marion Warren must be contacted for copies of these photographs. A computer index is in progress for this collection, but until it is complete, please contact the Curator of Photographs for access to this collection. Not all negatives have prints. Negatives do not circulate. This collection consists of approximately 450 stereographs dating betweenc.1870 and c. 1920. The stereographs contain some very early views of Annapolis, Maryland, and other views around the state. There are also a number of stereographs of Washington, DC, Philadelphia, PA, and scenes in Florida,New York, Iowa, Illinois, Wisconsin, Minnesota, New England, the National Parks and other views of the Western U. S. The Columbian Exposition is represented, as well as the Philadelphia Centennial Expo, the Pan American Expo, and the World's Fair. There are also international scenes, such as World War I and the Sino-Russian War, and scenes in England, Canada, France,and the Philippines, among other places. These photographs were taken by staff photographers of the Baltimore, Maryland News American between 1880 and 1965. The approximately 500 photographs in this diverse collection cover such subjects as fires, floods, road construction, desegregation, street scenes, World War I, and various community celebrations throughout the State of Maryland, from Cumberland to Ocean City. Baltimore City, skipjacks on the Chesapeake Bay, World War I training (possibly at Fort McHenry), and visits of Franklin D. Roosevelt to Chestertown and Aberdeen are all represented in this collection. Restrictions: No commercial use of this collection is allowed without the permission of the donor, Jacques Kelly. When known, News American photographers must be credited. A computer index is available at the Archives. Copy photographs made by Marion E. Warren for Mame Warren's book Then Again . . . Annapolis 1900-1965, published in 1990. 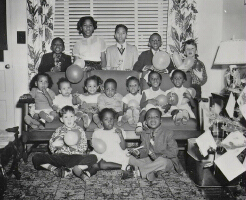 The original photographs fall between those dates and provide a wonderful cross-section of life in Annapolis for both the African-American and white communities during those years. The collection also contains many oral history interviews with long time residents of Annapolis. Restrictions: There are no restrictions on the photographs in this collection. A computer index is available at the Archives. Master recordings of the oral history interviews do not circulate. Patrons are responsible for bringing their own cassette players with earphones to listen to the copy tapes. 152 photographs of fires, fire engines, firemen, women's auxiliaries, and parades throughout the state of Maryland, as well as firemen's conventions in Frederick, Annapolis, Ocean City, Hyattsville, Mount Rainer, and College Park. The photographs date between 1900 and 1960. This collection consists of 39 copy photographs of postcards, stereographs, and photographs of Baltimore City during Old Home Week in 1906, Ellicott City, Elkridge, Riverview Park, Greenmount, La Plata, Goucher College, Easton, and other scenes in Baltimore City, including schools, hospitals and Camden Yards. Copy photographs made by the Archives of 60 photographs taken by Thomas Baden. These photgraphs, taken between 1945 and 1975, document the African-American community in Annapolis during those years. Subjects include weddings, birthday parties, black midshipmen, street scenes, parades, Carr's Beach, and the visits of such notable African-Americans as Joe Louis and Ella Fitzgerald. Approximately 200 photographs taken between 1920 and 1950 documenting the work of the Civilian Conservation Corps, the Park Service, and the Boy Scouts towards planting and caring for trees in Maryland's State Parks, towns, cities, and rural areas. 48 copy photographs of photographs of Frederick, Maryland, mostly taken by Frederick photographer J. D. Byerly. The dates of the photographs range between c. 1860 and c. 1890. Subjects include street scenes, parades, buildings, floods, the Maryland Institute for the Deaf, among other events and buildings.